This was the summer when everything went crazy. In retrospect, I should have seen it coming. Everything always goes crazy in the offseason after you make the Champions League for the first time. But it had been a while since I was in this situation, and I confess, it caught me by surprise. Fortunately, I got my bearings quickly, and—partly compensating, in my mind, for my shocking collapse during my first offseason at Pro Vercelli—I finally pulled off a couple of maneuvers worthy of the greatest manager in the history of the world. Remember Sergio Solari, the Argentine defensive midfielder I brought in as a midseason replacement last year when I found myself with no choice but to let Jacopo Sammarco move to Schalke for a measly €6.5 million? Solari had, at best, a decent half-season, averaging a 7.09, completing 77% of his passes, managing one goal and two assists in 19 games. Adequate, but for the money I spent on him (€9 million, at that point a record high for the club) not exactly bioluminescent. Well, Roma saw something they liked in him, because they knocked on my door with a bid of €12 million, and when I told them to make it 18, they said yes before I’d even finished the sentence. I almost turned them down; after all, Solari had just arrived at the club and might get better once he’d adapted to Italy, and as I knew from the search that brought him to Vercelli in the first place, good defensive midfielders were hard to find. But then I had a Thought. Schalke were hurting for cash, and now that we were in the Champions League, Sammarco might just be willing to move back to Italy. Why not try to turn this thing around, and make up for some of the grief I’d given myself for letting Sammarco get away in the first place? As it turned out, Sammarco was dying to come back to Vercelli, and Schalke bit on a bid of €13.5 million. Best of all, I got €3.5 million back thanks to a “50% of profits from next sale” clause we’d worked into the last transfer deal. I sold Solari to Roma for €18 million and brought Sammarco back to Vercelli for €10 million. Seen in a vacuum, the Sammarco deal was still a crazy, Defoe-to-Portsmouth-and-back arrangement. We essentially gave Schalke €3.5 million to take Sammarco on loan for half a season. But view it in conjunction with the Solari deal, and you’d see that we’d maintained our sharpness at defensive midfielder, qualified for the Champions League, emerged with the same promising young player we’d started with, and turned a net profit of (€6.5 – €9 – €13.5 + €3.5 + €18) = €5.5 million. A shiny piece of business, especially since I at least mildly suspect that Solari won’t ever justify that transfer fee at Roma. You Honor Me. But Probably Not Enough. We needed a new right winger. Landry Akassou had played well for the club for many seasons, but he was out of his league in terms of raw ability. He always seemed to finish games with high ratings, but about half of our attacks also seemed to end with him losing the ball to a more technically savvy defender. On top of that, I’d decided to make Ibrahimovic our new captain, and I didn’t want Akassou having to start in case losing the armband made his mind go lousy. Time for another player search. Napoli were poor and he was desperate to leave, so he could be had for fairly cheap: around €9-10 million. The problem was that as soon as I put in a bid, there was a good chance it’d trigger bids from all the other clubs that were following him. So how could I a) discourage them from chasing him and b) manage to offer him a better contract if they did? His personality was “Model Professional,” which suggested he’d go to whichever club made him the best offer rather than be guided by loyalty or romance. I thought of everything from “schedule a friendly against Napoli and deliberately try to injure him, thereby reducing his value to other teams” (wouldn’t work: it was the summer break) to “send someone to provoke him in a nightclub and try to get him arrested, thereby reducing his value to other teams” (sadly, one of the few aspects of the sport that the FM series doesn’t model). Finally, it occurred to me that I had players Roma and Inter wanted, too, namely Ibrahimovic and Arnaldo Mora, our young right back. With inspiring deviousness, I entered into negotiations to sell them those players, then put in a €9.25 million bid for Contini. Of course, Inter and Roma instantly entered Contini bids of their own. I don’t know, because the game doesn’t give you this kind of feedback, but I will always believe that it was the bids they had in for my players that caused them to under-budget their contract negotiations with Contini, which in turn caused him to pick Pro Vercelli as his new club just in time for me to cancel the talks to sell Ibrahimovic and Mora. I know. I felt evil. (It felt good.) But don’t worry; I faced some tough consequences. Ibrahimovic got temporarily huffy about the fact that I wouldn’t let him move to a bigger club. Yeah. Bummer. — and congratulated myself on a job well done. That was the team. We’d gotten Sammarco back, dramatically improved on the right wing, and turned a hefty profit. Offseason accomplished. But the newest occupant of the Walter Colombo Memorial Assistant Manager’s Stool (I’d sacked Manuel Marchini and replaced him with Roberto Colapietro, who was also a coach for the England team) thought we were weak at left back, and it was true that our 5’3″ speedster Michele Napolitano was looking a bit quaint compared to the rest of our emerging teamsheet. What the hey, I thought. I’ll take a spin around some left backs. A commanding leader with an influence of 20…a master technician at set pieces (corners, free kicks, and penalties all at 20—and he’s left-footed! )…a strong, quick, brave defender who can also play in six positions and control the game with his passing, teamwork, and decision-making…and he was interested in coming to Pro Vercelli. Thank you, Champions League. What was ironic was that after the insane lengths I’d gone to to get Contini, Dogan, a player I was even more excited about, required nothing at all: no other teams were chasing him, Werder Bremen accepted my first bid of €7.5 million, and the whole thing was wrapped up in about five minutes. I’ve made him our new vice-captain under Ibrahimovic, but if everything goes according to plan—if he learns Italian, adapts to the club, and plays well—he’s going to be our captain for many years to come. A.C. Milan agreed to hold our show-down bid-off over David, our co-owned prodigy, a year early. I put in €3.4 million, which was half what he was worth, sort of thinking that they’d offer €20 million and I’d lose him, but he always hurt anyway so who cares (I thought). 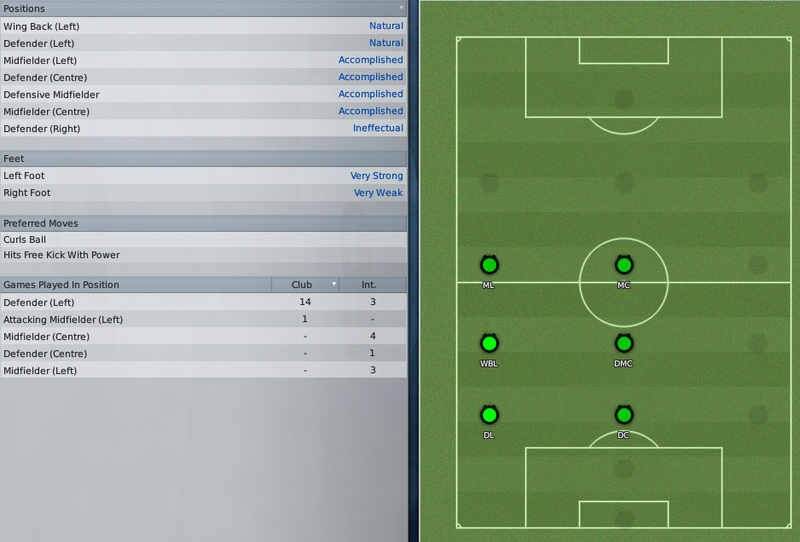 Instead, they bid €3.4 million as well, which meant that I got to keep him (tie goes to the holding team, essentially). Thank you, excess funds left over after selling Arnaldo Mora. Please stay healthy, David. You know you’re Raistlin to us. There’s always the danger, but we can’t do this without you. The training facility has also been upgraded, and is now described, efficiently, as “top.” Looking at our virgin aisles of rowing machines, our pristine grass, and our teamsheet for next season (Larsen; Dogan, Marcelo, Ibrahimovic, Kulik; Sammarco; Arteaga, Rubino; David, Contini; Galli), I feel the surpassing calm that comes from expecting to be really, genuinely good next year for the first time since I came to Pro Vercelli. We’re not deep enough yet to challenge for the league or (obviously) the Champions League, but we’re going to thrill some people. I cannot wait to unleash the power that I have created. Excellent, I’m chuffed to bits! I reckon you’ve got an outside chance of the league Brian. I think I’m more excited about this than the spurs game tomorrow! How’s the youth team coming along? Great stuff Brian, some really good signings there. I always find the summer before the team’s first Champions League campaign to be the hardest. You’re trying to improve the team without disrupting the flow or camaraderie. You’ve probably signed and let go of a few more players than I would have but considering the job you’ve done with Pro Vercelli I’m not gonna start questioning your ability now. Watching all this develop over the past few years . . . um, weeks . . . see, that’s the interesting thing. Time. I keep thinking of that Simpsons episode in which Lisa grows an entire civilization in a petri dish with a tooth. when she goes to bed they’re in the Stone Age. She wakes up the next morning and there’s some tiny guy nailing a piece of paper to the door of a church. (Lisa exclaims, “I’ve created Lutherans!”) The Pro Vercelli saga is like that. Great Finds! Dogan looks class. Always good to have a deadball specialist that can also throw the ball the length of most pitches. Seriously, that guy looks like the German Rory Delap. Hopefully he doesn’t develop a bum shoulder. His aggression is a little low, but he looks like he’d be a great defensive mid. You could train him to ‘natural’ in that position too. Nowhere near good enough, but all that comes to mind right now is “ebullience” (especially seeing as it, literally, means to boil). When purchasing players, how have you determined initial offers? I note you use player search, or manually search a lot. When I play (with ’07) I handicap myself by only pursuing players found by my scouts. Or, who I have set my scouts to track after we played against them, or they featured in an international match. I generally rely on my scouts who will say something along the lines of, “a bid of at least €4 million would be required…”. If you see a €7 player you’re interested in, how do you determine you bid? Do you not send you scouts to further watch players you have stumbled across? P_B — I not only scout players after I find them, I have elaborate hierarchies among my scouts that determine which of them I use in which situations. (There are some I trust more than others, even though their numbers aren’t as good. This is probably superstition on my part.) Determining the initial bid is largely guesswork, but I try to compare different scouts’ sense of the range (they vary widely, with certain scouts consistently over- or underestimating the amount), then look at the financial situation of the selling club and make a decision about how much I’m willing to part with. It’s complicated by the fact that even in ’09 the computer doesn’t really know how to negotiate—one of the few really annoying aspects of the game—and I often wind up in a maddening outbound spiral where I bid 1, the computer counters with 5, I respond with 3, and the computer counters with 9. So then I think, okay, fine, 5, and then the computer counters with 13. I wind up canceling a lot of negotiations completely, waiting a couple of days, then entering an adjusted bid. dee — Naci, who’s pictured above, and Lukas Tuma are my backup midfielders. It’s not an ideal situation, because Naci is also my backup left winger, and David is hurt a lot, so I frequently wind up thin (and Tuma is terrible). Fortunately, my starting midfielders (Sammarco, Arteaga, and Rubino) can all play in the DM spot, and my new fullbacks are both versatile, multi-position players who can cover all the midfield positions, so I’m hoping to have a slightly more comfortable margin next year. I actually teach a ‘negotiation’ unit at my university, and the 1-5-3-9-5-13 process actually does make sense. Their offer will be based on what you’re willing to pay, so it just means that they assess the player’s value ‘to you’, which they can only guess initially (5), however, they then realise that their guess was too low, and as such try to extract as much value as they can. This especially occurs if they want to keep the player, as their BATNA – best alternative to negotiated agreement – is actually keeping a player they want (think of it as the opposite of a knock down price of a transfer listed player. I’m sure that’s the logic behind the computer model, t’OM, but I really doubt that it describes the normal behavior of real teams negotiating over a player. Once the selling team has named an acceptable price, I’d be very surprised if they then disowned that price and demanded more every time the buying team tried to meet them halfway. I’m sure there are exceptional cases, but I’d guess that normal negotiations involve finding the acceptable middle after an initially low bid and an initially high counter. Fair enough, and that’s a valid point, I’ve just seen so many people rubbish this transfer structure as ‘illogical’ (not only on this website) and I felt the need to show that there was a real (albeit not fool proof) logic behind it. and yes, i know i’m reading this in a time capsule and i’m years too late– but this is the internet, dammit! I was never going to comment since I’m years behind this, but not only a video gaming football fan, but a closet geek as well? I’m going to read everything you’ve got out there now. I luckily found you on Grantland because I followed Simmons there. For all of his cultural references, he can’t compare with that Raistlin reference. That one had me yelp out loud with joy (at work mind you). It was a perfect analogy for the situation and so obscure! Congrats on the Champions League, can’t wait to keep reading and see how it all unfolds.